What gives you the Power to cheer? Is it the long lasting friendships that are gained or the satisfaction you get from the nailing your routine after hours of practice? Whatever it is, you can get even more power from the Power Bolt. 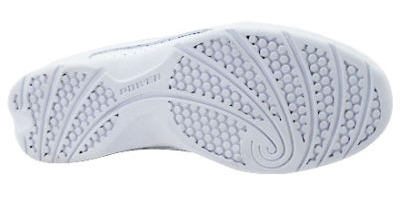 The Power Bolt is a good, streamlined looking shoe. The low-profile sole not only gives the shoe a sleek look, but is also extremely durable so it can be used indoors and outdors. The Power Bolt is an affordable cheerleading shoe that will meet the needs of squads of all levels and of all ages. From our experience fitting cheer shoes we have found that the Power Bolt typically fits small and narrow. In kids sizes, the Power Bolt tends to fit about 1 to 2 sizes smaller than regular street shoe sizes with most people going up 2 sizes. In women's sizes, we have found that the Power Bolt tends to fit about 1/2 size to a whole size smaller than regular street shoe sizes. Of course, these are just recommendations and we do not guarantee fit.